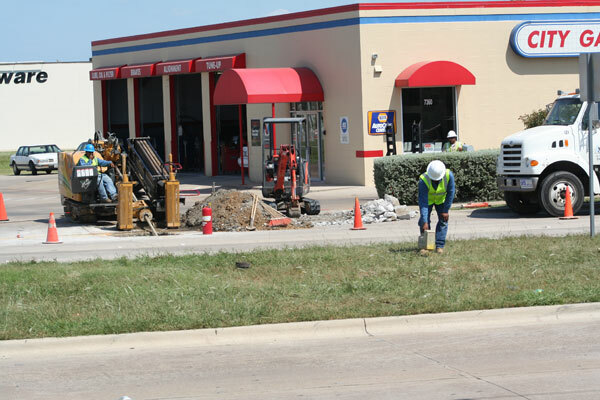 M. J. Sheridan of Texas, Inc. (MJS) serves major gas utility companies with installation of residential and commercial gas lines. The work includes both new and replacement installations. In the state of Texas alone, M. J. Sheridan of Texas installed over 20,000 natural gas service lines in 2013 and in the last 10 years, 300,000+ Houston homes received gas installations by MJS. 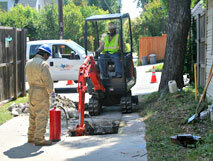 As of November 2006, MJS is installing CenterPoint Energy's service lines in Houston. 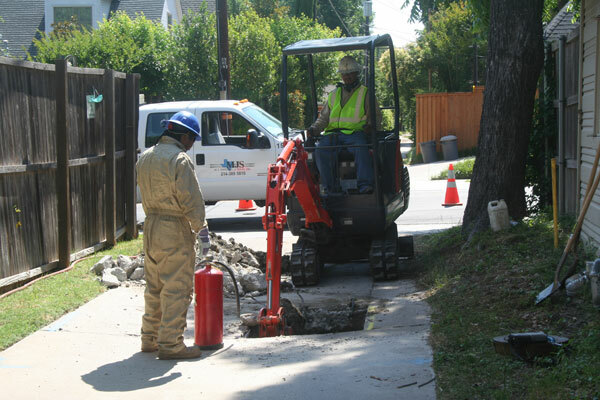 MJS has over 40 years experience in the excavation and installation of gas mains. We have experience with all pipe dimensions and pressures in both poly pipe and steel. MJS has a wide range of heavy equipment and the expertise to build, extend or replace gas mains. In some cases, the main construction is done in conjunction with other utilities, i.e. joint trenching. 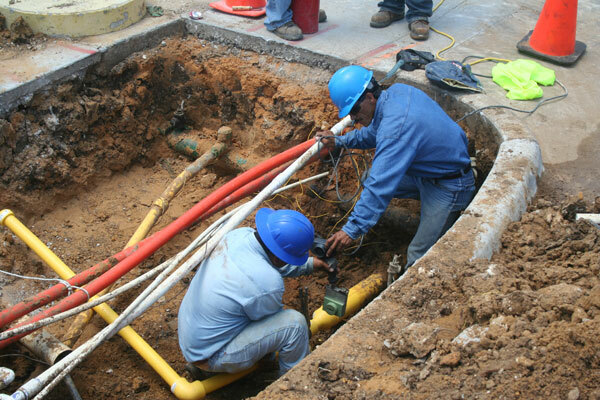 We also have the capabilities to perform maintenance on gas mains. Our foremen have between 5 to 25 years experience in the gas industry and they install several hundred gas main projects per year. Recent gas main replacement projects in Waco and Dallas involved over 10,000' of cast iron replacement, ranging from 4" to 10" cast iron. 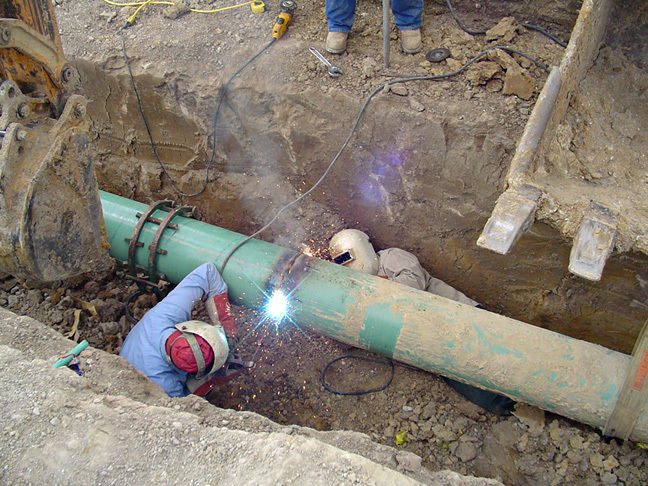 M. J. Sheridan of Texas Inc. provides Pipeline, Communications and Fiber Optic Constructions. MJS provides Emergency Call-Out response for utility companies 24/7 and 365 days per year. Most of our emergencies consist of homeowners without gas service. We provide steel tapping and plugging, fresh air, directional rigs, excavators, missiles, tampers, vactron- trucks and steel plates to return the emergency back to a safe and normal condition. Nothing is more important than the safety of our employees and the community. Our field employees are certified as Operator Qualified as required by Department of Transportation (DOT). Our training program consists of organized group training, on the job training and mock training at our offices. Our new employees complete a thorough pre-employment orientation and job specific training program given by our safety department in order to safely perform covered tasks. Ongoing safety and training is a continuous process within MJS. Innovation is a trademark of M. J. Sheridan of Texas Inc. - employing state-of-the-art software & hardware to maximize efficiency and minimize overhead. IT plays an important role in our operation, as our information systems gather real-time data throughout our network of operations, enabling close control and monitoring of safety, quality, cost and time. System generated reports, historical benchmarking and inter-company key ratios all contribute to streamlined control and efficiency. M. J. Sheridan of Texas Inc. has offices located in 3 cities and is presently expanding our representation into other U.S. states. MJS is a privately owned corporation headquartered in Houston, Texas. M. J. Sheridan of Texas, Inc. was formed under current ownership in 1988. In 2014, with over 225 highly trained employees and an inventory of over 400 pieces of construction equipment, MJS has the experience and preparedness to tackle all major projects. At MJS, we know our employees make the difference. Therefore, training and developing our workforce to promote from within is our corporate philosophy. Our low turn-over rate is a measure of our success. In Houston, the Blaze, a 13U boys Select Baseball Team, won the Divisional Playoff and the World Series at Baseball USA in 2006 and has won many Select tournaments. In Austin, MJS has assisted in rebuilding local churches. Yearly donations are made to Operation Graduation programs in various cities. All login services are currently available. M. J. Sheridan of Texas Inc. - Utility Contractor - Specializing in Gas - Houston, Texas.